Ji Cheng will be on the start line this weekend. Will Chinese interest in pro cycling follow? A Chinese man on a bicycle, what’s more unremarkable than that? Millions ride their bikes to get to work, run errands, and haul things all over the most populous country on the planet, from Harbin to Kunming. Yet, it took more than a century for a Chinese rider to appear in the world’s most famous bicycle race, the Tour de France. The 101st edition of the grand tour begins Saturday in Leeds, England, and then circumnavigates France for the next three weeks, ending on July 27 on the Champs Elysees in Paris. Ji Cheng, a 26-year-old rider from Harbin, will be among the 198 riders at the start. Ji in fact has already made history, becoming the first Chinese rider to participate in cycling’s two other grand tours. He completed the 2012 Vuelta a Espana and started the 2013 Giro d’Italia as a member of Dutch-sponsored Team Giant-Shimano, for which he has ridden since 2008. But don’t expect Ji to make any headlines at this year’s Tour as he’s there strictly as a domestique, providing support for the team leaders. While Team Giant-Shimano does not have anyone to contend for the yellow jersey, given to the Tour’s general classification (GC) winner, it does have one of cycling’s best sprinters in Germany’s Marcel Kittel. Ji’s main job will be to lead out for Kittel in the finishing stretches of sprint stages. In such setups, support riders provide aerodynamic cover for the top riders, who emerge from the “train” in the final hundreds of meters to sprint for the stage victory. Last year, Kittel had a breakout performance on the Tour, winning four stages, including the final one on the Champs Elysees. That China has produced no cyclist of note until Ji’s emergence might seem a mystery to some. After all, shouldn’t China have millions of cyclists to pluck from and train into world-class athletes? The reality is that the world of professional road cycling is very different from any other form of bicycling. It’s an expensive sport that requires sophisticated equipment and long periods of training in different altitudes and climates. The cost and process is much more akin to elite sports such as golf and tennis. For the most part, road racing has been an exclusively European sport until recently, when the United States and Australia got into the act. American Greg LeMond became the first non-European to win the Tour in 1986 and the now-disgraced Lance Armstrong made the event global when he claimed an unprecedented seven yellow jerseys in succession from 1999-2005. For China to make inroads into professional cycling, it may have to follow the American template. The U.S. was an afterthought in cycling until the late 1970s, when promising riders were identified at an early age and tested extensively. The best of the lot, including LeMond, were shipped to Europe to train and compete. When there was a bigger base of top-level riders, U.S. companies sponsored teams composed of mostly Americans to compete in events on the cycling calendar. Team 7-Eleven was formed in 1981 and participated in the Tour de France for the first time in 1986. Motorola, the U.S. Postal Service and the Discovery Channel would subsequently sponsor teams with leading American riders. Of some, but lesser importance, was having major races held in the U.S., starting with the now-defunct Tour du Pont on the East Coast and then the one-week Tour of California. The U.S. – particularly California – does have the advantage of offering good road conditions in different topography to replicate routes in typical major European races. Chances are, China simply might not be interested in breeding pro cyclists, since it’s cost-prohibitive and there is a very slim chance for glory as opposed to the Olympic sports the country already takes seriously. In fact, China’s cycling program is entirely focused on track racing, which did bring it two silvers and a bronze at the 2012 London Olympics. With Ji in the Tour, at least the world-famous event will finally get noticed in China, as it did in the 1980s in America when LeMond became a household name. 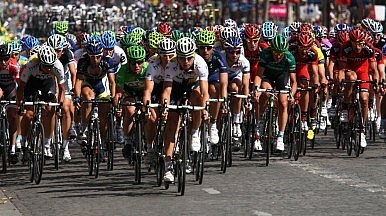 Team Giant-Shimano realizes the historic impact when it picked Ji for the nine-rider roster to participate in the Tour. “When we started working with him as a young talented rider back in 2008,” team coach Rudi Kemna said in a statement, “we made a long-term plan and this has seen him develop into the highest level of the sport and we see him now playing an important factor in the sprint formations. Ji’s main goal, no doubt, will be to complete the grueling, 21-stage, 2,272-mile race while propelling his team leader Kittel to as many stage wins as possible, and maybe even the green jersey awarded to the Tour’s top sprinter. But no matter what his role is, there will be more people – as well as bicycle riders from all walks of life – rooting for Ji than for anyone else. Could the rider spur a road cycling boom in China?